You can’t look anywhere these days without seeing Fortnite. It’s the latest gaming phenomenon, and is easily the most popular game on the market right now. This means that you probably know plenty of people that play the game, and you might even have some Fortnite fans on your holiday shopping list. And, if you’re not necessarily into Fortnite yourself, it can be difficult to find the perfect tech gift for these folks. Luckily, we here at TechRadar are tech experts – it’s in the name, after all – and we’ll help you find the best gaming monitors for Fortnite fans. 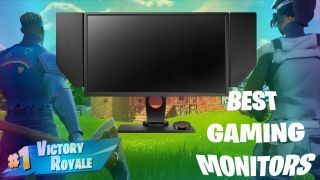 When you’re looking for a gaming monitor either for yourself or a loved one, there are a couple things you need to keep in mind, especially if it’ll be used to play a fast-paced online game like Fortnite. High refresh rates and low response times are far more important than getting a high resolution and a massive display size. Yeah, we know, it’s all a bit confusing, but we got you covered. We’ve picked out the three best monitors for Fortnite, across a range of different budgets, so that you can find the best gift for the Fortnite fan on your list. We’ve been singing the Asus VG248QE’s praises for years now. With a 144Hz refresh rate and a 1ms response time, it’s the perfect monitor for Fortnite. And, because it’s only a 1080p panel, it’s extremely easy to drive on mid-range hardware – though you’ll need quite a rig to power it at 144 fps. However, this is a TN (Twisted Nematic) monitor, which comes with a few downsides. You’re not going to get the same levels of image fidelity and color accuracy that higher-end IPS and VA panels boast. But, you’re going to get an extremely fast monitor that’s great for online games like Fortnite. Unfortunately, it falls short when it comes to most single-player games out there, however, this might not be a downside for Fortnite players. If the Fortnite fan on your list is all about getting together with their friends and playing, well, Fortnite with their friends, the BenQ Zowie XL2540 is perfect. It has privacy screens surrounding the monitor, preventing other players from screen-peeking to gain an advantage. But, beyond that admittedly very niche appeal, this is genuinely one of the best gaming monitors for Fortnite players. It’s packed to the brim with features that will make any multiplayer game shine. Just look at that whopping 240Hz refresh rate – if you have the horsepower to drive that high frame rate, Fortnite will be an extremely smooth experience. When you’re shopping for the best monitor for Fortnite, there are a wide range of different things to look out for. You can go for low-resolution monitors like the one we just explored, where your response times will be faster, because your screen updates faster. But, that’s not the only way to go. What if we told you that you could see more of the game at any given time, through the use of an ultra-wide display? Well, with monitors like the Alienware AW3418DW, you can actually kind of have both. Not only is this a lovely high resolution display at 3,440 x 1,440, but it also has a refresh rate of 120 Hz. That means you’ll see more of the game world than you would see on a standard 16:9 display – which should give you a leg up over the competition. It’s not a cheap monitor, nor is the hardware required to run it. But if you or your loved one is playing Fortnite on a high-end PC, there’s no reason to not go with the Alienware AW3418DW. Plus, even out of game, the desktop experience on an ultra-wide monitor is second to none.